I am on a mission this autumn to change the way we use quince. We have been ignoring quinces far too long! Of course, cooking with quince is no foreign concept to a Persian. I agree, quince cannot be eaten raw but this is no excuse for ignoring this beautiful magical fruit. Whenever I talk about cooking with quince, I hear stories about someone's mother or someone else's grandmother had a quince tree and used to make quince paste, jelly or jam. Really? I am not referring to quince paste. I am talking about using quince as an ingredient and as a star of a dish. Quince is a very strange fruit, it starts off yellow but when simmered for a long time it turns pink/red. Quince is fragrant, delicate, slightly tart and full of pectin. It goes well with red meat and is fantastic in baking. I love autumn not only because quinces are in season, but because the weather is perfect, not too hot with crisp fresh air and crimson red leaves everywhere. It is the time of the year, we start to cook more comforting hearty dishes and the evenings start to get longer perfect for the season's endless apple crumbles. Having received my first quinces last weekend, I cooked a very hearty but super effortless lamb and quince stack. Like lasagne, I layered all ingredients and left it to simmer on low heat until completely cooked. I am not quite sure why this dish is called 'toss kebab', it could be because ingredients are tossed into a pot?? maybe. Peel and slice the onions about 2cm thick. In a medium pot, Saute the onions in a little oil and turmeric on high heat, until softened. Reduce the heat and cover the onions with a layer of lamb steak. Add about half a cup of water, a little salt and pepper for seasoning. At this stage, there should be a lot of liquid in the pot almost like soup. 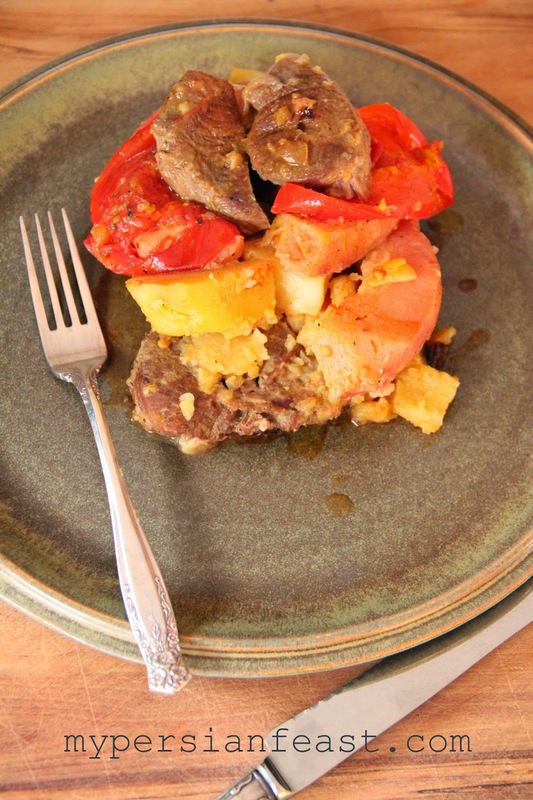 Add a layer of peeled and sliced quince, then a layer of potatoes, capsicums and finally a layer of tomatoes. Cook for a further 20 minutes, check the potatoes and quince. Simmer on low heat until the liquid has thickened and about 1cm of sauce is left.